A team of scientists from the University of Southampton have developed a revolutionary ultrasonic attachment for taps, which massively enhances the ability of water to clean. Professor Tim Leighton and Dr Peter Birkin’s device works with cold water, minimal additives and consumes as much electrical power as a light bulb. Its application will be wide, including cleaning in food preparation, hospitals, manufacturing and the home. The new technology consumes less water and power than the established competitor technologies. 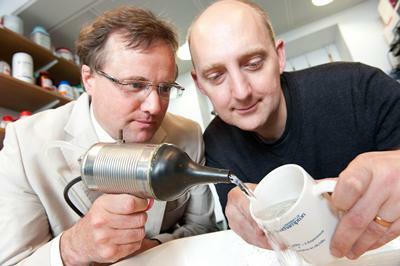 In recognition of their invention, Professor Leighton and Dr Birkin were today (10 November) awarded the Royal Society Brian Mercer Award for Innovation 2011.